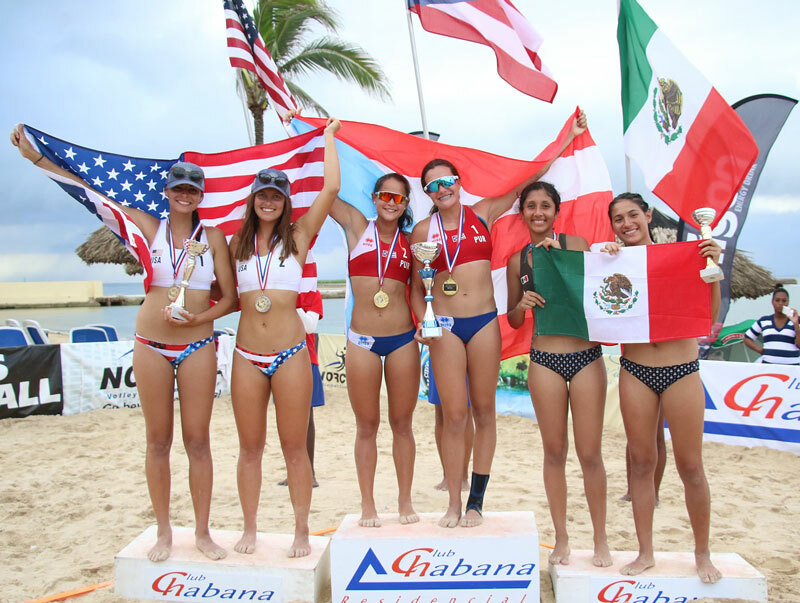 The United States pair of Devon Newberry and Lindsey Sparks became the 11th team to qualify for the beach volleyball tournament at the 2018 Youth Olympic Games after placing 2nd at the 2018 NORCECA qualifying tournament in Havana, Cuba last weekend. They will be joined by Allanis Navas/Maria Gonzalez of Puerto Rico, who beat the Americans 2-1 (13-21, 21-15, 15-13) on Sunday. The win by the Puerto Ricans came after losing by the reverse score earlier in the tournament. A total of 32 teams participate in beach volleyball Games in the Youth Olympics in each gender, with players born between January 1, 2000 and December 31, 2003 eligible to participate. Each national federation is able to enter 1 team of 2 athletes per gender into the tournament, with Argentina being given an automatic entry. The rest of the participants are determined by continental qualifiers, and the 2018 U19 World Championship in Nanjing, China from June 26th-July 1st. The final 5 teams are selected by the Tripartite Commission. Beach volleyball made its Youth Olympic Games debut at the 2014 championships, where Russia won boys’ gold and Brazil won girls’ gold. The Americans didn’t medal in that tournament, though the Canadian pair of Megan and Nicole McNamara, who currently play in the US for NCAA National Champions UCLA, took silver. Indoor volleyball still isn’t offered at the Youth Olympics, as through three editions the IOC has shied away from the kind of large single-sport delegations that come with most “team sports” (as defined by the IOC). In the boys’ NORCECA qualifier, the hosts from Cuba will send pair Miguel Angel Ayon and Jorge Luis Alayo to the event after sweeping Puerto Ricans William Rivera and Randall Santiago in the final 2-0 (21-14, 21-19). The Americans Tim Brewster and John Schwengel lost to Cuba in the semi-finals and won the bronze medal match to just miss the automatic bid – though they’ll still have later chances to qualify. Quarterfinals: Atenas Gutiérrez/Karla Romero (MEX) d Anny Michelle de La Cruz (DOM) 2-0 (21-18, 21-18), Dana Roskic/Erika Vermette (CAN) d Thalia Enamorado/Amanda Armenteros (CUB) 2-0 (21-15, 21-10). Semifinals: Devon Newberry/Lindsey Sparks (USA) d Atenas Gutiérrez/Karla Romero (MEX) 2-0 (21-15, 21-18), Allanis Navas/María González (PUR) d Dana Roskic/Erika Vermette (CAN) 2 -0 (21-13, 21-14). Bronze: Atenas Gutiérrez/Karla Romero (MEX) d Dana Roskic/Erika Vermette (CAN) 2-0 (21-13, 21-16). Quarterfinals: Leonel Garza/Franky Hernandez (Mexico) d Cole Irwin/Robert Kemp (Canada) 2-0 (21-17, 21-16) and Tim Brewster/John Schwengel (USA) d Deivy Ramírez/Raymer Sarmiento (Republic Dominicana) 2-0 (21-12, 21-17). Semifinals: William Rivera/Randall Santiago (Puerto Rico) vs. Leonel Garza/Franky Hernandez (Mexico) 2-1 (21-17, 19-21, 15-8) and Miguel Ángel Ayón/Jorge Luis Alayo (Cuba) vs. Tim Brewster/John Schwengel (USA) 2-0 (21-18, 21-17). Gold: Miguel Ángel Ayón/Jorge Luis Alayo (Cuba) d William Rivera/Randall Santiago (Puerto Rico) 2-0 (21-14, 21-19). Bronze: Tim Brewster/John Schwengel (USA) d Leonel Garza/Franky Hernandez (Mexico) 2-1 (21-16, 17-21, 15-13).